Adorable Outdoor Wood Cottage Playhouses for Kids! Best Looking Outdoor Playhouses for Children to Play Inside made of Wood! How would you like to get a very realistic miniature ‘country home’ for your kids to play inside? I just found a few of the cutest and most adorable outdoor wooden cottage playhouses for kids! They are so gorgeous and so much fun! 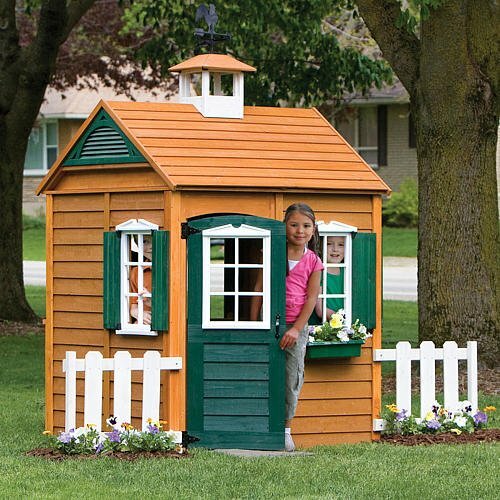 Adorable Summer Cottage Cedar Wood Playhouse for Kids! As you can see, these cute wooden country homes for children look just like real houses in the wood! From the working doorbell to the beautiful doors and windows, outside bench, flower boxes, snack window, miniature sink and stove and even a fun cordless phone! Cedar wood is one of the best kinds of woods to have outdoor, since it’s naturally an insect repellent and very durable! It can definitely stand the test of time! Usually assembly will take two people approximately three hours, but once you guys are done it will be worth your while! Craftsman Cottage: Fun Outdoor Playhouse for the Backyard! Another cute and fun wooden cottage playhouse for the kids! I love the huge activity windows! Makes the playhouse very bright! They usually fit kids between the ages of 2 and 3 to about 10 years old! This Craftsman Cottage kit will come with the wood all pre-cut already and the instructions are easy to follow. 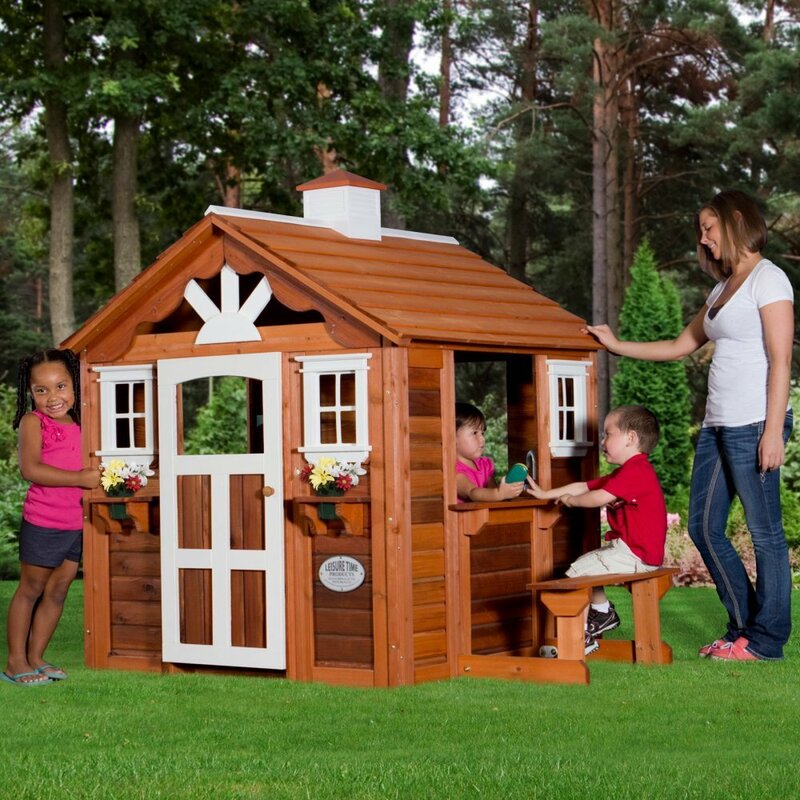 KidKraft Modern Outdoor Wooden Playhouse for Kids ages 3 to 10! 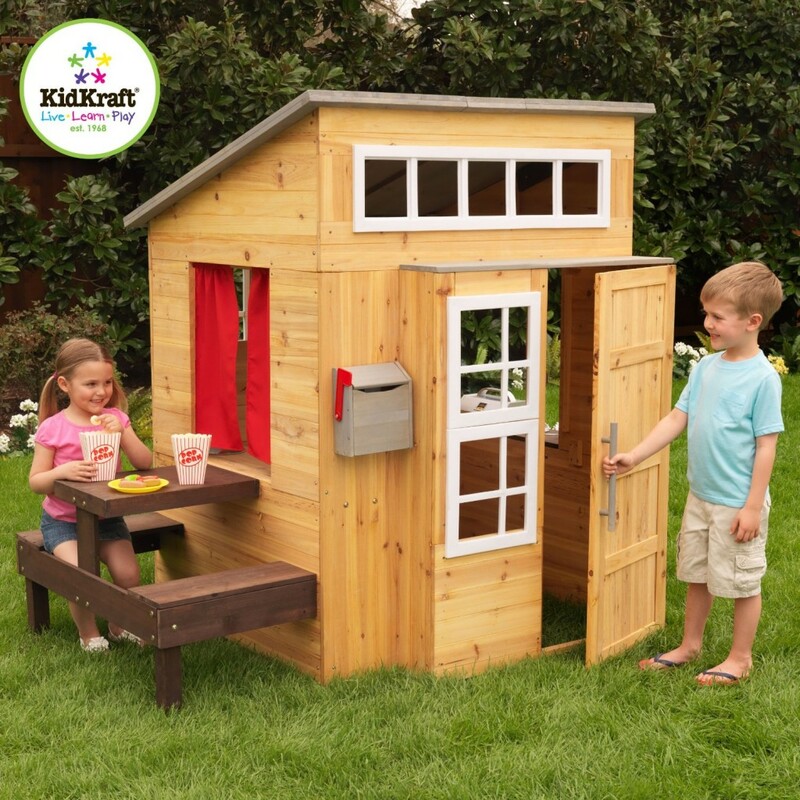 This is a cute and very affordable outdoor wooden playhouse by KidKraft! Check out the picnic table and benches! Kids are gonna love eating out! There’s also a cute mailbox with flag and an outdoor grill too! What a cute little house to have in the backyard! The kids are gonna love barbecue days with the family! While moms and dads grill ‘real’ barbecue, the kids are also gonna play pretend in this cute playhouse! *Check it out! The kids are having a blast playing inside their cute wood house! Best Outdoor Playhouses for the Backyard! Another cute wooden playhouse for kids with working door, serving counter, sitting bench and cute windows! It fits about four kids inside! Everything comes pre-assembled and the instructions are pretty easy to follow. What a fun way for kids to use their imagination and develop their improvisation skills too! Cute Cedar Wood Child Playhouse with Sandbox! 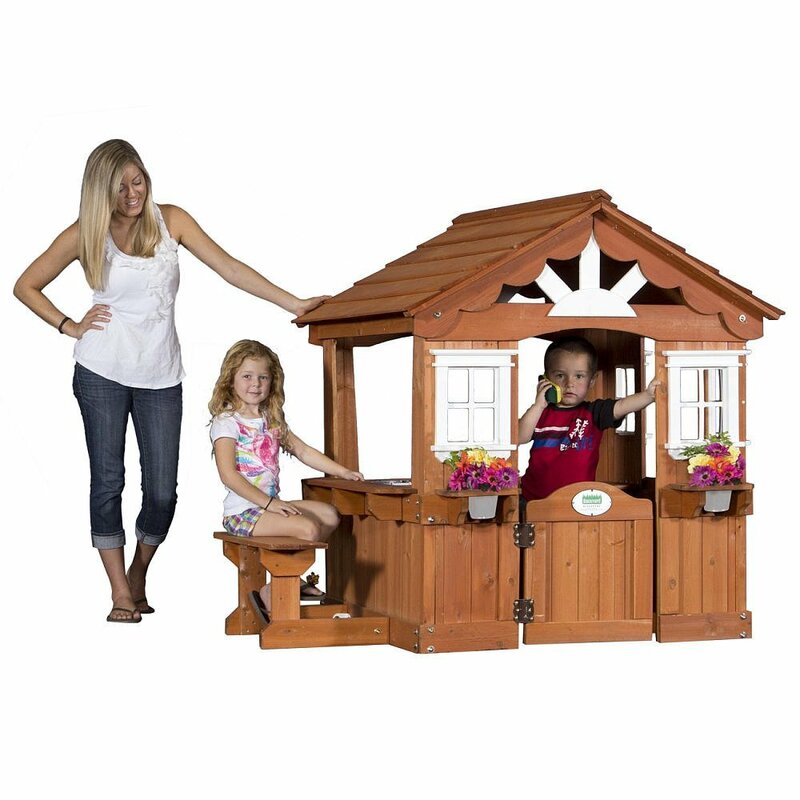 This cute and fun cedar wood playhouse for kids comes with a bonus sandbox included! It also has three wide activity windows, a cute wood flower box and two activity buckets! 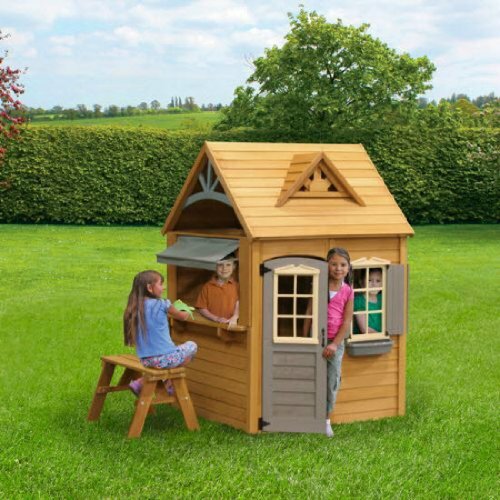 This adorable wood playhouse is perfect for smaller children, around 3, 4 and 5 years old! Bayberry Playhouse: Ready to Assemble Wooden Playhouse with White Picket Fence! The Bayberry Playhouse is an affordable and very cute ready-to-assemble wooden playhouse that fits three kids inside from ages 2 and 3 to about 8 years old. The white picket fence is the icing on the cake and it makes this wooden house looks like a real home! The cute flower box gives it a nice loving touch too! I love the traditional Dutch door! 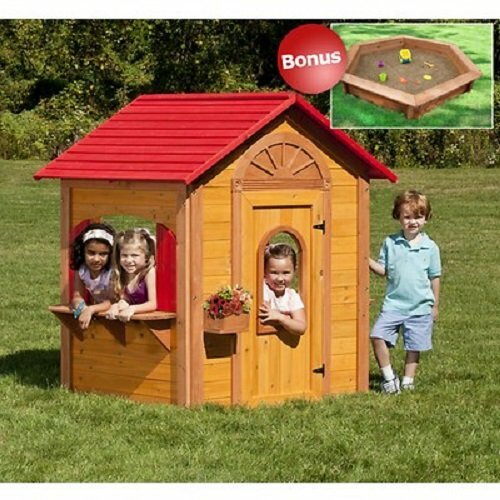 How adorable is this outdoor wooden playhouse with a green plastic roof? It is the best birthday present for a 3 or 4 year old little girl! It will take about 4 hours to assemble but the instructions are very easy to follow. When you see your child’s face after you are done it will be worth it! Don’t you just love the side bay window? The playhouse is made from solid wood. Cutest Outdoor Wooden Playhouses for Children! Another cute and adorable wooden playhouse for smaller kids! As you can see it’s very ‘open’, so your kids will not get scared to stay inside. The snack window and the side bench are perfect for kids to have real snacks while they play house! It also comes with fun accessories such as a cordless phone, play stove and sink! I love the ‘country style’ design too! 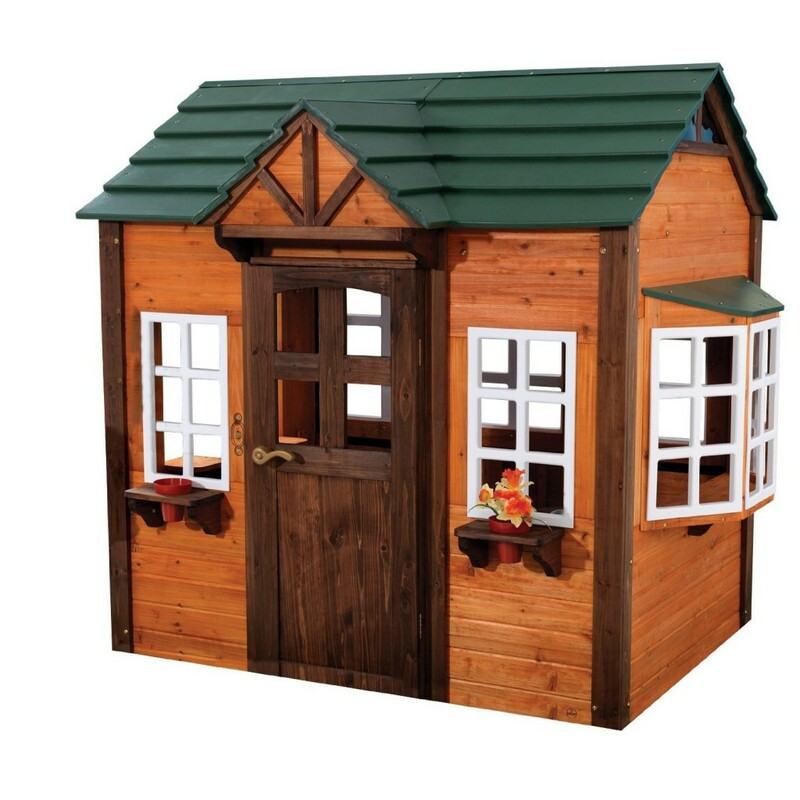 If you are looking for a realistic 6 x 6 cedar wood shed playhouse for kids, this is it! 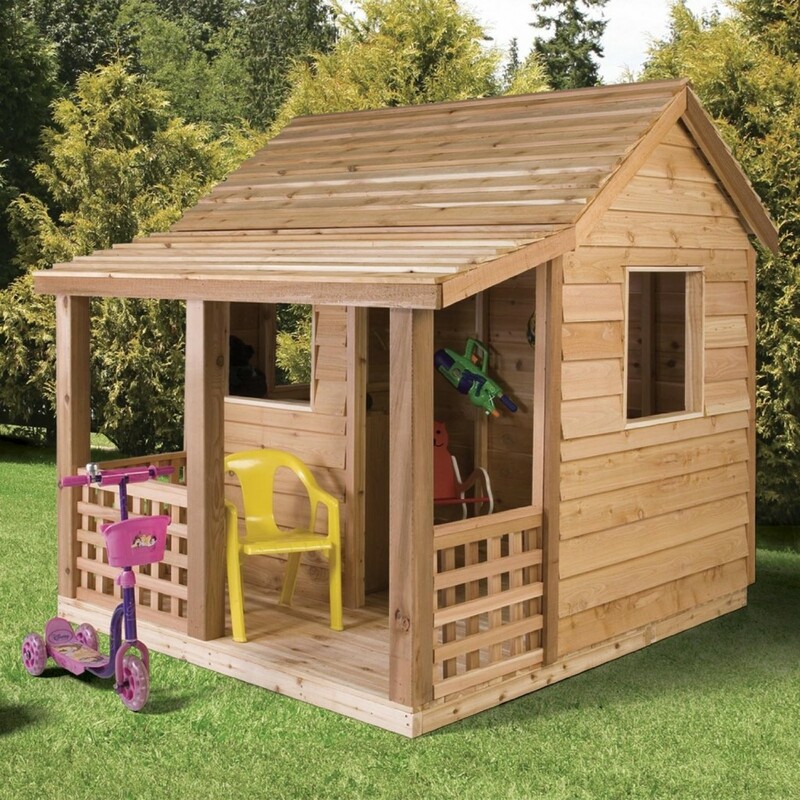 It is an adorable and very spacious wooden playhouse cabin with a fun porch! It comes pre-assembled and it will take you a few hours to put together. Once it’s done it’s time to start decorating! You can even put a small wooden table and chair inside so your kids can draw and color and even do their homework! Little girls also love playing with their favorite dolls and stuffed animals inside! Also great fun place to do some reading with your kids! 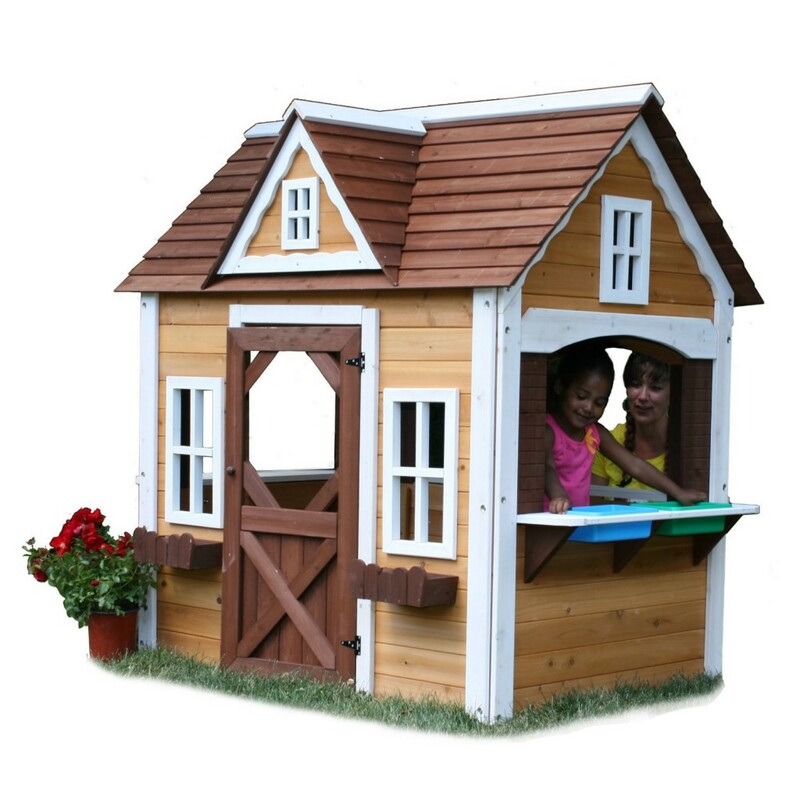 *I hope you had a good time choosing a fun wooden playhouse for your child!